Known for her work in radium research, Berta Karlik is one of two scientists credited with the discovery of the 85th element, astatine. Berta Karlik is also recognized as a pioneer for women in STEM and was the first female professor at the University of Vienna. Berta Karlik was born on January 24, 1904, in Vienna, Austria. She was homeschooled for her elementary education and later attended a grammar school in Wenzgasse, Austria, graduating best in class. Karlik went on to attend Vienna University, where she studied physics and mathematics. At a time when it was uncommon for women to go to a university, let alone study mathematics or physics, Karlik did both and graduated with honors. Karlik received a scholarship from the International Federation of University Women, which enabled her to study in world-renowned labs. Under this scholarship, she worked in the laboratory of Sir William Bragg at The Royal Institution in London, England. Later that same year, she spent time at the Curie Institute in Paris, France. At the Curie Institute, Karlik worked with many notable scientists of the time, including physicists Eva Resmtedt and Lise Meitner. 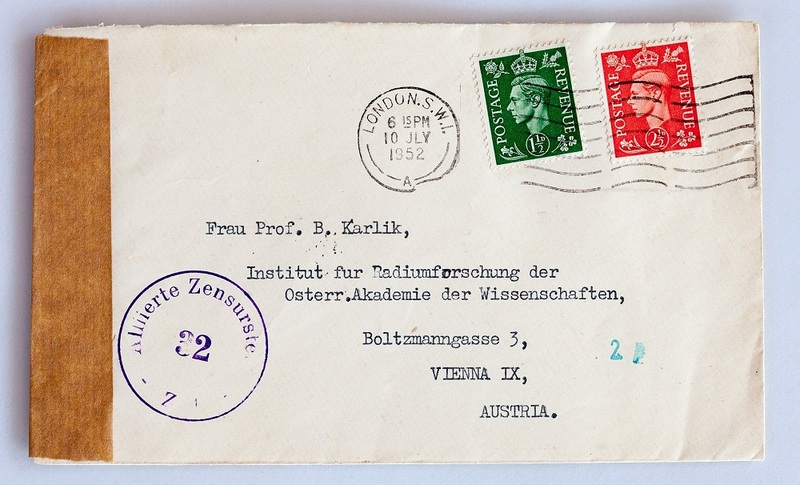 A letter addressed to Berta Karlik during her professorship at the Institute for Radium Research in Vienna, Austria. Photo by Thirunavukkarasye-Raveendran. Image in the public domain in the United States, via Wikimedia Commons. In 1931, Karlik began work at the Institute for Radium Research in Vienna, Austria. 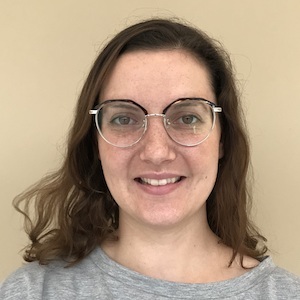 Though she began as a scientific assistant, Karlik made many strides in her career during her time there. In 1937, she gained her habilitation, or qualification to teach at the university level, and was awarded venia legendi, or permission to lecture at the University of Vienna. In 1945, after WWII, she took over the Radium Institute, and in 1956, she became a full professor at the University of Vienna. While working at the Institute for Radium Research, Berta Karlik and her colleague Traude Bernert discovered naturally occurring astatine. Bernert and Karlik found that astatine occurs naturally when they observed alpha particles being emitted from the radioactive decay of a radon isotope. Around the same time, research groups from Sweden and the U.S. were also working to find the “missing element” from the periodic table. The first group to be recognized with a successful discovery of astatine was a team from the University of California, Berkley, in 1940. They found that the element can appear synthetically when bismuth is bombarded with alpha particles. Karlik and Bernert’s discovery is left out of some records, with sole credit given to those who discovered its synthetic version. This could be because the duo conducted their research during German occupation in WWII, so there was little communication allowed in and out of their country. 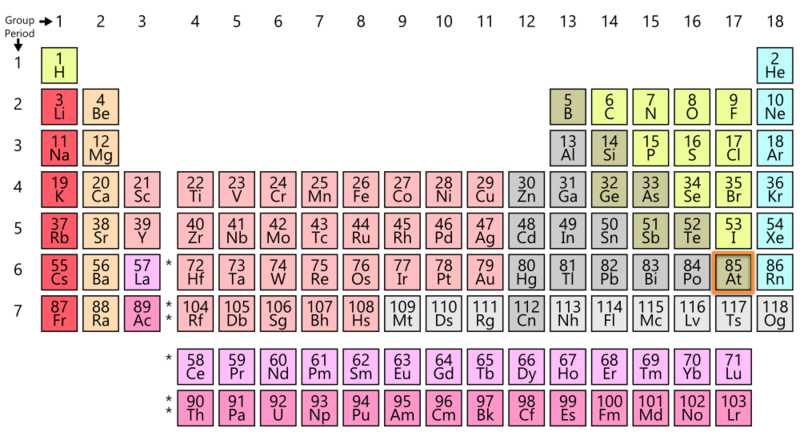 Left: Astatine highlighted in orange in the periodic table of chemical elements. Image in the public domain via Wikimedia Commons. Right: Astatine’s electron shell. Image by Greg Robson — Own work. Licensed under CC BY-SA 2.0 UK, via Wikimedia Commons. Astatine’s 33 known isotopes are all radioactive, so today, the element is used for research only. However, other astatine isotopes could have real-world uses. For example, astatine 211 could potentially be used for radiation therapy. Though Berta Karlik’s discovery of astatine with Traude Bernert is regarded as her most important research, she also worked on crystallographic methods of studying hydrocarbons at The Royal Institution, where she coauthored a book on crystallography data tables. She also studied radium therapy at Hammersmith Hospital in London, as well as the radioactivity of seawater in Sweden. In 1973, Karlik was inducted into the Academy of Sciences and was the first woman to become a full member of the organization. She was also a member of the Austrian Academy of Sciences and Leopoldina Academy, and holds both the Haitinger Prize of the Austrian Academy of Sciences and the Prize of the City of Vienna. Let’s wish Berta Karlik a happy birthday!